It is time to start paying closer attention to a developing situation that could have far-reaching consequences. We are referring to the drought in the United States. This is a site from University Nebraska-Lincoln that monitors drought conditions and displays a map that is updated weekly. The university partners with United States federal agencies, so we can trust these people. We'll still see how the media is covering this by going to a link at USA Today. This paragraph in the USA Today article explains why we have a topic for this separate from our usual weather news. Only three droughts in the Dust Bowl years of the 1930s (1934, 1939 and 1931) and two droughts in the 1950s (1954 and 1956) were worse. So why should you pay attention to this, if you are not a farmer or in the water sports recreation business? Food is the first issue that comes to mind. Daily food budgets will be increasing for basics. And animal feed price increases will also mean increases in meat prices. In a later post we might look at what nations around the world might be able to take up the slack and export more of what those affected areas in the United States are known for. 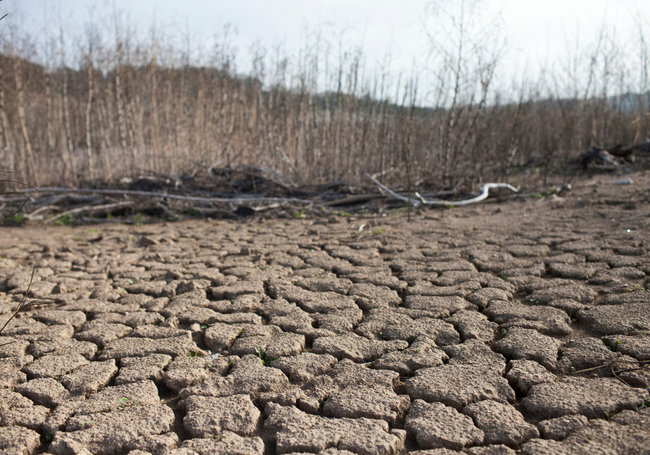 The National Climatic Agency is saying it's the worst drought since 1956. Had no idea one existed and can only hope every state/province has one. People are unsure of what to do to survive and need all the help they can get. Hopefully the Feds and State are playing nice for once and cooperating fully with the exchange of information. SPICEWOOD BEACH, Tex. — The water that once nourished this central Texas community never traveled far: it came from a fenced-in well at the edge of Lake Travis, down a winding street next to the golf course. These days, the water that flows from kitchen and bathroom faucets takes an extraordinary journey that can be measured not in feet but in miles. This drought-stricken place in the scenic hills outside Austin has been forced to bring in water by truck from more than 10 miles away because its sole well came close to running out of water. Spicewood Beach is one of four subdivisions in Burnet County that became the first communities in Texas to run so low on water that it had to be hauled in by truck. The four subdivisions, made up of about 1,100 people in a part of Texas known as the Hill Country, all relied on the Spicewood Beach well. Trucking in water to survive is scary, but life saving. WIthout a safe well in your back yard, this is the only way to survive right now. More communities may be joining the truck brigade if this drought keeps going for a while. Water is precious and it's been abused for centuries, polluted by man even though we need it to survive. The drought is bringing that reality to light. This image may become the norm. Blame it on Global Warming or something else, but the reality is still there. Our weather is changing and we have to start acting instead of hoping that it's going to go away by the fall. The sooner we wake up the better off we will be. Waiting until the last minute is not the way to go. The bed of the Colorado River is drying up and cracking in some parts of Spicewood Beach after more than a year of drought. Agriculture Secretary Tom Vilsack is warning Americans to be on the lookout for food price gouging, as the historic drought creates an opening for stores to overcharge unsuspecting customers. Echoing the views of other agriculture industry analysts, Vilsack said Wednesday that as the drought batters America's crop supply, prices at the checkout line could eventually rise as a result. But that won't happen yet, he said, suggesting that any shopkeepers who dramatically raise prices now are just trying to scam customers. "The important thing right now is for consumers to be aware," Vilsack said. Vilsack said customers should not see food price increases at grocery stores until later this year, or early next year. The secretary said ranchers' herds are also suffering from the drought, and that the price of beef, poultry and beef could likewise rise later this year, or early next year. Why not make it law? Give the consumers some protection, because not all will speak up and demand that prices return to normal. Why not make it law? That would be nice, but wont count on it. Until those powers that be take the hit at the grocery store, they will be all talk and no action. Food is the first issue that comes to mind. The image below shows what has and is to come this summer. Only places off the hook so far are Alaska, Washington State, Puerto Rico, Maine, New Hampshire, Vermont and New Jersey. Rhet-or-Ric & others I fully agree with all of you. I noted one potato farmer was suffering in Eastern Canada, only to have someone come to his potato Patch to did up a maze of potatoes. When I was a fruit grower I had to sort of patrol my bins of truit I had not picked, in my orchard , from people that decided to steal from the bins I had NOT delivered to the packing house. This was well bevore C-68 around 18 yrs ago. So often I tended to patrol the bins with an old 12 gauge pump action shotun with most of them being blanks, but latter two were heavier shot. Very sort of not looked upon as being the correct thing, but stealing from the bines was a bit of a bummer for I had babied those apple trees with very little fertilizer, to the pruining, the insecticide to wipe out the insects----all of that costs MONEY. There are a number of ftuit stands willing to offer people apples, cherries, prunes, peaches, or apricots from their ftuit-stand places almost beside Hwy 97, for a low price. Farmland speculation is happening in Ontario. Real estate agents that sell farmland are aware that some private sales occur before land is even listed. Sometimes, existing farmers make an attractive offer to neighbouring farmers in order to use the land or lease it to someone else. Just remember if you'd like to enter this area of the economy, Canada Revenue Agency does not allow you to apply farm income losses against other incomes, only farm income, on your annual income tax returns. You'd also be unlikely to plan to get involved in hydro generation to earn money by selling to the power authority but maybe it might help you with your barns or fieldwork. So have some money saved for those less than stellar crop years or times when the bank won't advance you money for equipment, seeds or fertilizer.